(Clearwisdom.net) On October 5, 2004, Falun Gong practitioner Ms. Gao Rongrong, whose face had been disfigured by electric baton shocks in the Longshan Forced Labor Camp in Shenyang City, escaped from the No. 1 Hospital affiliated with the China Medical University. The local authorities were thrown into panic. To prevent the extensive exposure of their crimes, they are taking all measures to find her. The police stations and the police precincts at the railroads, at commercial aviation sites and at Shenyang's oilfield and peripheral cities and regions received orders to apprehend Gao Rongrong. In addition, they received a "Notice for Assistance in Investigation" originating with the letterhead from Shenyang City's Judicial Bureau. Besides being forwarded to police stations and police precincts, this notice was also distributed to the city's district neighborhood administrative offices, communities and subdivision residential committees. It was further distributed to information stations, real estate agencies, the household management service companies and others. With this notice being distributed to all of these municipal entities, the atrocities committed by the Shenyang City Judicial Bureau and related departments are also being exposed. For many, this is validating what they had already heard about the persecution Gao Rongrong has suffered. Some said with indignation, "I cannot see anything wrong with Falun Gong. Now I know that it's those so-called law enforcers taking advantage of their power to persecute good people, and they never do anything good! Who would assist them?" Photo 2: On May 7, 2004, Gao Rongrong's face is covered with burns from electric baton shocks. The picture was taken ten days after the torture. The notice raised many questions from those who saw it. Why was Gao Rongrong sent to a forced labor camp? Why was she sent to a hospital? What caused the obvious scars on the left side of her face, which the notice referred to as a distinguishing mark? Gao Rongrong's picture on the notice has no scars on her face. Why did the notice use a picture without scars? 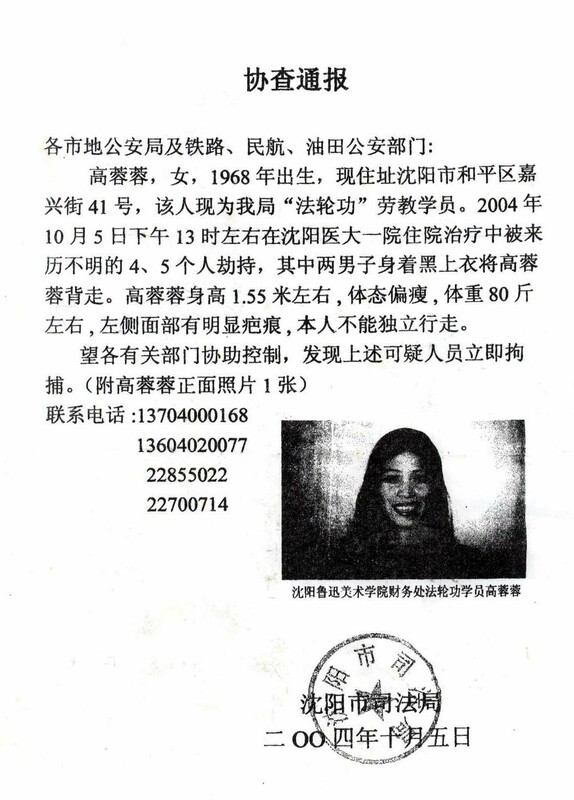 The notice said that she was abducted by 4-5 men -- how could that have happened with several policemen guarding her night and day? As early as several months ago, the public was made aware of the fact that officials in the Longshan Labor Camp disfigured Gao Rongrong's face and otherwise tortured her in following directives from the Shenyang City's Judicial Bureau. The notice says that there are obvious scars on the left side of Gao Rongrong's face, but the attached photo was taken before the disfigurement. The Judicial Bureau and related departments have many copies of photos and videotapes of Gao Rongrong after the disfigurement. They know that it resulted from being subjected to seven hours of electric shocking. Tang Yubao and other policemen in the Longshan Forced Labor Camp committed this atrocity. After the shocking, Gao Rongrong's face was charred and covered with burns. Gao Rongrong is a law-abiding citizen who follows Truthfulness-Compassion-Tolerance to be a good person. An innocent civilian was disfigured, but in order to hide their crimes, the police further imprisoned and persecuted the victim. The notice says that Gao Rongrong was "abducted" from the hospital. As a matter of fact, abductions and kidnappings have become common occurrences conducted by Jiang's regime and its 610 Offices, the police, the prosecutors and judicial officers at various levels, used as a means to persecute Falun Gong practitioners. During the past five years, huge numbers of Falun Gong practitioners have been abducted or taken away to detention centers or so-called study sessions, and have suffered physical and mental torture. More than 6,000 have been illegally sentenced to prison, more than 100,000 have been sent to forced labor camps, and more than 1,000 have been verified as having died as a result of torture.